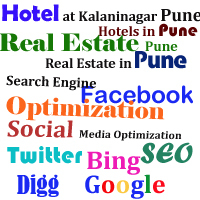 “Hotels in Pune” keyword having high weightage in SEO work or we called it in Search Engine result. The millions of competition for this keyword. Because of in Pune there is increasing hotels. For example if you look on Lavasa like cities are many hotels and opening many hotels coming soon. Now days, this keyword is fully reserve for PPC world, in SEO is very high competition to get first rank result on Google. Now how can SEO people help to get hotel website get rank. It will take time to get rank. This competition word no body wait for SEO result every one wants good result instant level. That time hotel owner or website holder going with paid word like online advertisement on various types of sites. I remember before 5 or 6 month ago there is high competition for real estate in Pune or real estate punekeyword in paid & organic seo and still it continued. These types of competitions are going in Hotels in Pune keyword.